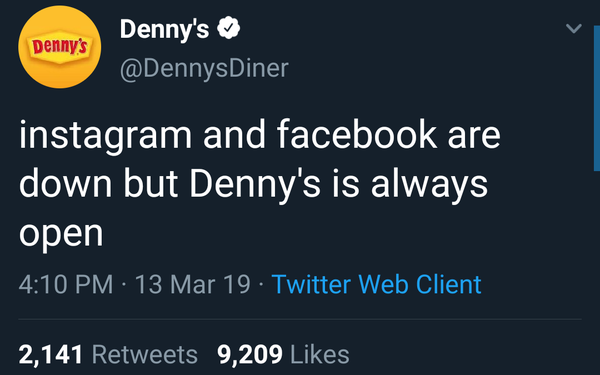 The 1,330 Retweets and the 5,767 Likes as of 5:12 P.M. Eastern Time demonstrates that people still have a sense of humor, but the day-long outage is anything but funny for Facebook and its advertisers. Facebook Ads Manager, the company's advertising platform, also took a hiatus from producing many millions of dollars daily in ad revenue. For the fourth quarter in 2018, the company reported $16.6 billion in ad revenue. Facebook and Instagram have been down for the better part of the day worldwide. The message “Sorry, something went wrong. We’re working on getting this fixed as soon as we can” greets those trying to get into the site at the door. Oculus, reported by some users, joined Facebook, Instagram and Messenger later in the day. Oculus, which Facebook owns, responded on Twitter writing they were aware of the problem and are working to resolve the issue. Facebook also responded on Twitter, acknowledging their problem with people accessing the service. DoS or denial of service attacks occur when one system is targeted by multiple compromised systems that are often infected with a Trojan. Perhaps a coincidence, or maybe not, Facebook, Instagram, Messenger, and Oculus were not the only platforms that went down today. Google Gmail, YouTube and Docs also experienced outages.